There is no doubt that UFC fans will be familiar with Dustin Poirier. The American mixed martial artist is one of the stars of the fight organization and is also currently one of the top ranking fighters in the official UFC lightweight rankings. A lethal fighter who was brought up in the MMA system, Dustin Poirier is a well-rounded fighter. His tendency to utilize power punches like overhands and use jabs and teeps to set up more powerful strikes like a cross make him a formidable opponent. For more information, here’s everything you need to know about the UFC star. Dustin Glenn Poirier was born on the 19th of January, 1989 in Lafayette, Louisiana. As a fighter, he got his start in high school when he wrestled at Northside High School. In 2009, he became a professional at it and afterward amassed a record of 7-0, competing mostly in regional promotions across his native Louisiana and the Southern United States. Like many of his peers at the UFC, Dustin Poirier’s road to the UFC started from the World Extreme Cagefighting (WEC). After the WEC merged with the Ultimate Fighting Championship in October 2010, all WEC fighters were transferred to the UFC. In his first fight under a new regime, Dustin won his fight against number 1 contender Josh Grispi at the UFC 125 was won by unanimous decision. Dustin Poirier’s career in the UFC continued at a steady climb in 2011, winning his two fights in the year. One by unanimous decision and the other by a second round D’arce choke. In 2012, Dustin’s steady career rise eventually got him a main event fight at UFC on Fuel after previously defeating Max Holloway in the first round of a fight with a triangle-armbar from the mount position. In his main event fight, Dustin was defeated by Chan Sung Jung via submission in the fourth round. The performance of both fighters, however, earned them Fight of the Night honors. At the end of 2012, the fight was considered the Fight of the Year by several publications. In his final fight in 2012, Dustin defeated Jonathan Brookins via submission, ending 2012 with a 2-1 record. Despite having his fight just 63 days before, Dustin Poirier returned to action and took on Cub Swanson in a fight. Sadly, the Louisana Native eventually lost the fight via unanimous decision. Dustin earned his second Fight of the Night bonus award in 2014, defeating Akira Corassani at the Ultimate Fighter Nations Finale. He won the fight via TKO in the second round. On September 27, 2014, the young fighter had one of the most high profile fights of his career against Conor McGregor. He lost the fight in the first round by TKO in a result he attributed to getting caught up in Conor’s trademark arrogance. After the loss, Dustin made some career evaluations and decided to fight only in the Lightweight division. In 2018, after 28 fights with 22 wins and his third Fight of the Night honors, he signed a new contract with the UFC despite still having three fights in his previous contracts. His next two fights after his new contract ended in a win for Dustin. 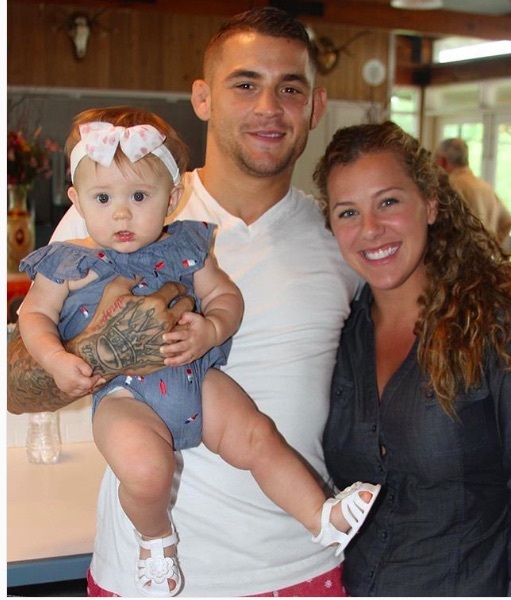 Dustin Poirier is a happily married man and devoted father. His wife, Jolie, got pregnant in late 2015 and on the 20th of August, 2016, the couple had their first child, Parker Noelle Poirier. Although from Lafayette, Louisiana, Dustin and his family relocated to South Florida for training purposes. 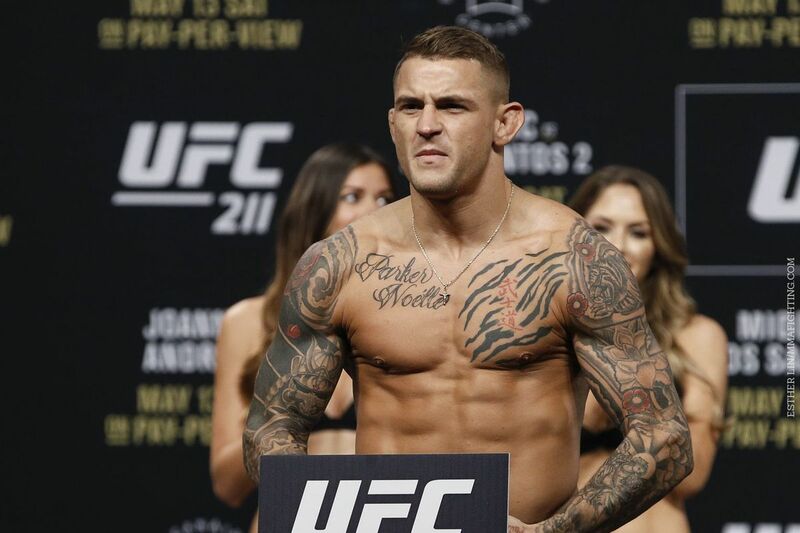 To be a successful fighter in the UFC, one has to be at the peak of their physical health; as such, Dustin Poirier is in great shape. The fighter has his height listed as 5ft 9in while his weight is recorded to be 155 lbs (70 kg). Other details of his body measurements are currently unknown. It’s easy for him to say in shape, seeing as he has to keep training and working out if he wants to continue on his winning streak. A formidable fighter and one bound to be on the UFC payroll for a long time, Dustin has been raking in lots of cash with his hot streak of wins. The American fighter is currently estimated to be worth $1.6 million. If he continues on his winning streak, that number will climb a lot higher in the near future.